Since doing smoothies, I have started to consume a lot more food that I wouldn't normally eat. I'm not sure if you know this about me, but I am a picky particular eater. For example, I don't like strawberries, but I like the artificial taste of strawberries. I don't like bananas, raspberries, blackberries, or blueberries. Never have. Too many of those dumb seeds. But when I put them all in a blender and make a smoothie, I find that I love it! I'm eating things that I never would otherwise. This is seriously a game changer. The way I see it, it is very hard to screw up a smoothie. There always needs to be a base- almond milk or yogurt, or both! 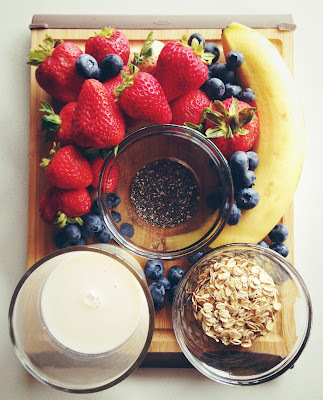 Put up to 3 different kinds a fruit, maybe add honey to sweeten the smoothie up if it is too tart, and and the "healthy stuff" like oats or chia seeds. Enjoy!